Today we celebrate a momentous occasion - our fourth participant to collect all seven days six days and a wildcard! So everyone join me in congratulating the amazing Bethany (@Auburnrose) on her well-deserved victory! Bethany - Feel free to swipe the button above if you'd like to display it on your blog! I've been giving a lot of thought lately to the future of this site. This has required me to give some thought to the past of this site as well. The condensed version is that while I have really enjoyed reading your responses, I believe my concept really only works with more participants. See, I try to spread the wins around a bit so everyone feels the love and nobody wins more than once a week. But with the same few participating on a regular basis (regardless of how seriously talented, witty, and faithful you have all been), it seems like I'm not always able to choose the "best" option. I'm feeling quite backed into the corner with the concept. So what to do? Because of the specificity of the concept, I'm not sure. The whole point is to have seven distinct categories and daily winners try to collect all of the badges. If I stop naming winners or do away with the categories, that destroys the concept making this just another writing cue blog. I'm also at a point off-blog where I'm more slammed than usual (oh, the joys of continuing my education) and could use a breather anywhere I can get it. For right now, I'm going to put new cues on pause. I will continue naming winners for the remaining cues so if you haven't participated (or want to try again - multiple entries per person is totally acceptable! ), go for it! I'm completely open to suggestions. Please don't give up on the site quite yet. I'll post an update soon. What lesson has life taught you that you wish you never had to learn? Some of the most beautiful things in life are found on the detours you never wanted to take. Reason: Being that I'm taking a few detours of my own right now, this really spoke to me. What lesson is this teacher sharing with her students? I'm telling you, kid, a truth, not a lie. Then you could take off that stupid green tie. Reason: Odd that the kids have to wear ties and not the teachers. That doesn't seem fair somehow. So I have this friend... Somehow she never feels like she measures up to the people around her. What advice can I give her that will help her feel better? My advice? Stop measuring yourself against others. Instead, focus on making the best choices you can each day. Measure only against yourself. Was today better than yesterday? "You did the best you could. And when you knew better, you did better." Being your best doesn't mean being better than others! Reason: Thank you, Liz, for your very realistic answer. Plus, anything with a Maya Angelou quote is alright by me. Today we celebrate a momentous occasion - our third participant to collect all seven days six days and a wildcard! She never did get the elusive Day Two but her fabulous haikus resulted in many wins along the way - including finally a Wildcard win to put her over the top! So everyone join me in congratulating the lovely Inspired Dreamer on her well-deserved victory! Inspired Dreamer - Feel free to swipe the button above if you'd like to display it on your blog! Write a letter praising a recent positive experience you had as a customer. Thank you for not calling the police. Signed : You know who. Reason: He answered twice, plus he's worked so hard that the management felt he was overdue for a day four win. It's ten o'clock. Do you know where your children are? All of the eggs are just as I left them, unfertilized and unhatched. Reason: Some great answers but this one made me choke on my water. Write anything you like about the word above. After his long journey with Dorothy through the land of Oz, the Tin Man and his new heart returned to his little house in the woods just off the yellow brick road. Many years passed and Tin Man started to notice his joints getting a bit stiff. He began using oil everyday, sometimes more than once a day to help keep him going. After a few years, Tin Man realized he couldn't even get out the door anymore without lubricating each joint a few times. That was when he knew he had rusted and it was time to go to the Lolly Pop Guild nursing home to live out his final days. Reason: Maybe I'm a bit biased because I'm reading Wicked at the moment, but Oz references make me happy. The Kentucky Derby was held on Saturday. Among the contenders were "Dean's Kitten", "Mission Impazible", and "Super Saver". What would you name your Derby contender? How sad would you be if he lost? "Aw, poor Sir Muffinkins!" What lesson has life taught you that you wish you had learned sooner? Sometimes you can't have the happy ending, but you can still have the good ending. Reason: Good endings usually make us happy eventually, right? You have some explaining to do. How did this window get broken and how is it not your fault? 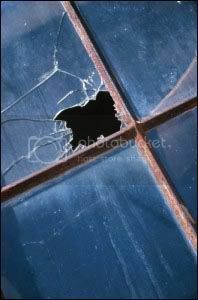 Yes, Miss Johnson, I did throw the rock that broke your window - but I was really aiming for that burglar in your tree! Reason: He was only trying to protect her! She should be thanking him. So I have this friend... At her wedding reception next month, she has decided to not have a cake. Instead, there will be fresh fruit and cookies. Could you address my concerns about the legality of this idea and whether or not it will have any bearing on if she is properly married? 05/07/10 - Another day with 4 great responses, just short of the 5 response minimum. No winner. But I love those of you who play so faithfully. Write a letter to an ice cream company explaining your idea for a new flavor and what to call it. 05/07/10 - No winner on this due to lack of response. Bummer, too. I liked this one. Your mother forgot your birthday. Reason: Full of win - and yum!